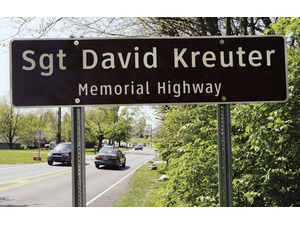 5533.254 Sergeant David Kreuter Memorial Highway. That portion of the road known as state route two hundred sixty-four located within Hamilton county, commencing at the municipal corporation of Cleves and extending in an easterly direction to the intersection of that route with South road, shall be known as the "Sergeant David Kreuter Memorial Highway." Added by 129th General AssemblyFile No.170, HB 325, §1, eff. 3/22/2013.